Okay, I may have made one or two slight alterations to the original display... Also before anybody burns me at the stake as a heretic for altering one of the greatest displays lego ever produced, bear in mind that this project began as a restoration. This original display had at some point in the past, been openned, looted, and damaged. 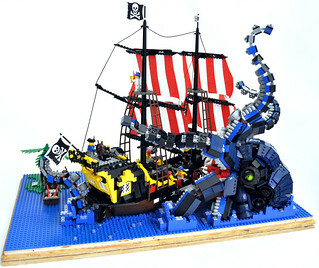 I took parts from my own original set to restore this display, and then may have made just a couple of small modifications to coincide with the release of the new Pirtates of the Caribbean Lego Sets. So let not a joyful voice be heard on the Black Seas Barracuda.